Vancouver, BC - Skyharbour Resources Ltd. (TSX-V: SYH) (OTC Grey: SYHBF) (Frankfurt: SC1N) (the “Company”) is pleased to provide an update on its fully-funded, summer exploration programs and announces that the government of Saskatchewan has granted regulatory relief to the Company with respect to all four of its drill-ready uranium projects in Northern Saskatchewan. 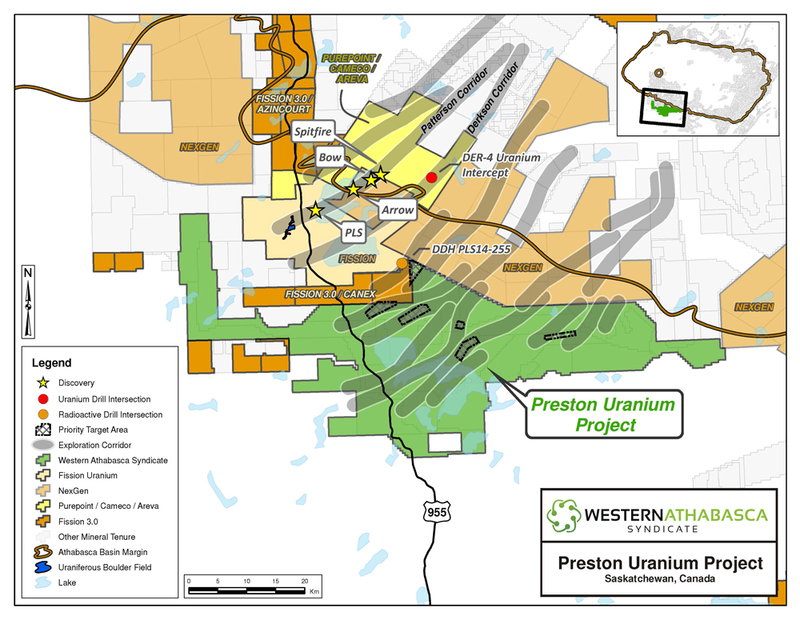 At the Preston Uranium Project, strategically located proximal to Fission Uranium Corp.’s shallow, high-grade Triple R deposit as well as NexGen Energy Ltd.’s Arrow discovery, Skyharbour and the Western Athabasca Syndicate are planning a summer exploration and diamond drill program to commence in August. The results from the most recently-completed geophysical surveys, combined with exploration results from previous field work, are being used to prioritize and refine targets for a planned drill program at Preston. Details of this summer exploration and drill program are forthcoming with Skyharbour as the operator of the project. The Western Athabasca Syndicate has carried out one of the largest regional exploration programs in the underexplored SW region of the Athabasca Basin. A total of approx. $4.2 million in expenditures on the Preston Uranium Project has been incurred including ground gravity, airborne and ground EM and magnetics, radon, soil, silt, biogeochem, lake sediment, and geological mapping surveys, as well as boulder prospecting and a nine hole exploratory diamond drill program. As a result of this multi-million dollar exploration program, fifteen high-priority drill target areas associated with eight prospective exploration corridors have been successfully delineated using a methodical, multi-phased exploration technique. In addition, the Syndicate holds an extensive, proprietary geological database for the project area as a byproduct of its substantial exploration work over the past twenty months. 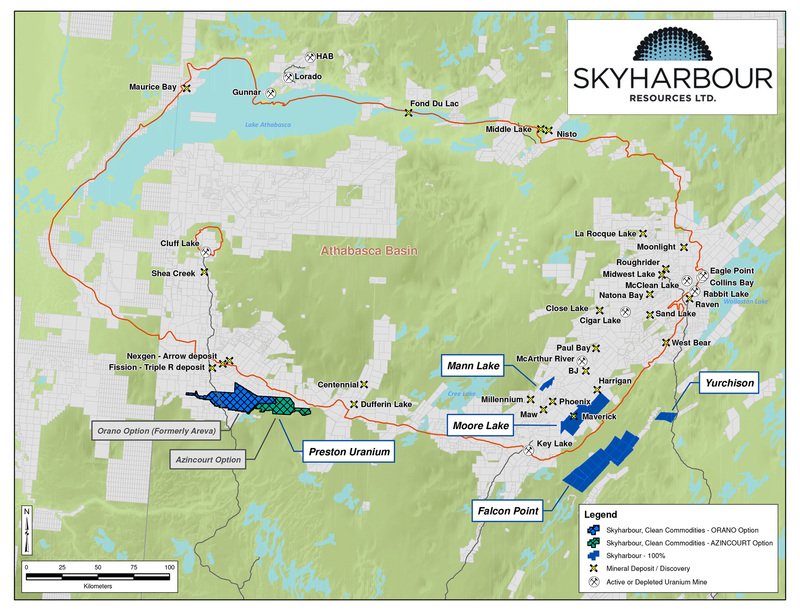 Skyharbour has also commenced a follow-up field program at its 100% owned, 79,003 hectare Falcon Point Uranium and Thorium Property located 55 kilometres east of the Key Lake Mill. This program will consist of detailed prospecting and vegetation/soil sampling at the Hook Lake target area where historical exploration returned high grade uranium grab samples with up to 48% U3O8 from a massive pitchblende vein exposed at surface. Previous operators have been unable to definitively explain and locate the source of the high grade uranium and thorium mineralization at the Hook Lake target. News will be forthcoming on this program as it is completed over the next few weeks. The government of Saskatchewan has granted regulatory relief to Skyharbour with respect to all four of its drill-ready uranium projects in Northern Saskatchewan. The regulatory decisions follow government reviews and legal submissions made by Skyharbour with respect to the forest fire situation in Saskatchewan. As a result of the regulatory decision, the Company advises that work requirements for the current assessment period at the properties have been satisfied by way of regulatory relief. The relief has been granted to the Company’s Falcon Point, Preston, Mann Lake and Yurchison Lake Projects in the Athabasca Basin which cover a combined total of 222,631 hectares. This equates to $3,470,605 in assessment work credits that Skyharbour has been granted to apply towards the mineral claims it has an ownership stake in. Skyharbour holds interest in an extensive portfolio of uranium and thorium exploration projects in Canada's Athabasca Basin and is well positioned to benefit from improving uranium market fundamentals with four drill-ready projects. The Company is the operator of the Western Athabasca Syndicate which controls a large, geologically prospective land package consisting of five properties in the Athabasca Basin of Saskatchewan. 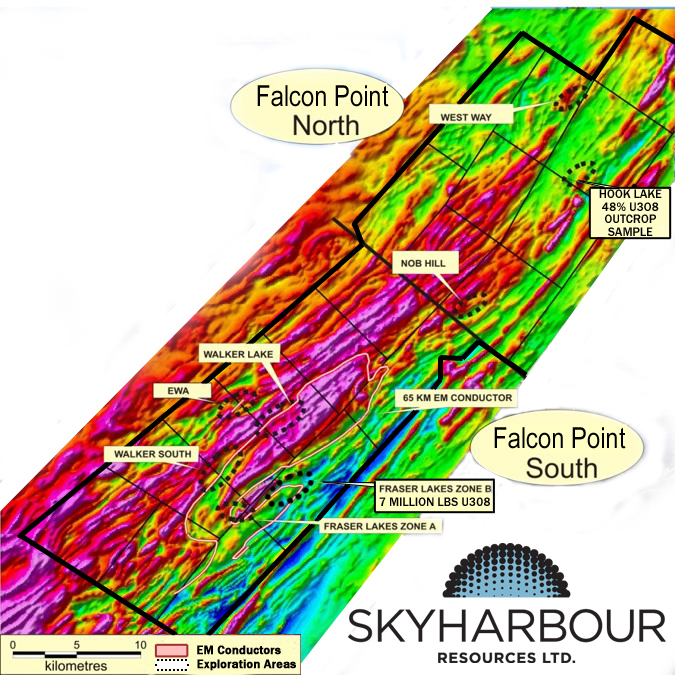 Skyharbour also owns a 100% interest in the Falcon Point (formerly Way Lake) Uranium Project on the east side of the Basin which hosts a NI 43-101 inferred resource totaling 7.0 million pounds of U3O8 at 0.03% and 5.3 million pounds of ThO2 at 0.023%. The Company owns a 60% interest in the Mann Lake Uranium project on the east side of the Basin strategically located adjacent to the Mann Lake Joint Venture operated by Cameco with partners Denison Mines and AREVA where high-grade, basement-hosted uranium mineralization was recently discovered. Skyharbour’s goal is to maximize shareholder value through new mineral discoveries, committed long-term partnerships, and the advancement of exploration projects in geopolitically favourable jurisdictions.